Blake Williams’s 2011 short Coorow-Latham Road is a 15-minute digital video made entirely of images sourced from Google Maps. In a single extended sequence, Williams tracks the entire eponymous roadway, located 250 kilometers north of Perth in rural Western Australia, using only the program’s 360-degree Street View function. By the end of the film, the camera has completed a 180-degree rotation, with the road now receding from view as we track backwards through the digitally conjured environment. Essentially a succession of still images mapped onto a moving panorama, the video is, like the application itself, a fabrication, a tapestry of dislocated moments that together suggest a temporally coherent experience. Although this wasn’t Williams’s first film to openly play with perspective––a number of his prior shorts were likewise studies of time, space, and subjectivity––it was the work that first suggested that his ideas concerning these subjects could not be confined to two dimensions. In the years since, Williams has been working largely in anaglyph 3D––one of the earliest and most elemental forms of multi-dimensional image-making, typified by the use of red and cyan color filters, one for each eye––and over the course of four arresting, conceptually driven shorts, he’s carved out a unique place for himself in contemporary experimental cinema. His most recent anaglyph short, 2015’s Something Horizontal, inspired by Maya Deren’s notion of dramatic vs. poetic form, suggested another transition. In Deren’s estimation, cinema works along two axes: the horizontal, predicated on character, action, and the linkage of events (in short, narrative), and the vertical, which traffics in more abstract characteristics such as mood, rhythm, and texture (what we might call the synesthetic aspects of cinema). Something Horizontal formally interrogated that hypothesis, playing the conceits off one another in a manner that allowed Williams to formulate a stylistic schema that could accommodate elements of each. PROTOTYPE, Williams’s first feature and his first work in stereoscopic 3D, not only expands on these interests but also further folds them into the film’s very form. Far more ambitious than anything he’s yet attempted, the 63-minute film traverses the whole of 20th-century America, serving at once as a meditation on modernization and an excavation of the cinematic apparatus across its many past and present incarnations. In this sense it is important to note PROTOTYPE’s peripheral relationship to narrative. Employing many of the basic tenets of storytelling, including a three-act structure, the film dives headlong into cinematographic history, conjuring any number of forebears while offering signposts for how one might read the film. For me, the opening sequence, a silent photo montage of post-hurricane Galveston and surviving locals, immediately brought to mind the prologue of Pedro Costa’s Horse Money (2014),which quietly cycles through images of early 20th-century New York tenement residents. Like many similar echoes in the film, whether the Lynchian reverberations of an ominous interlude that casts the manipulated vocals of Marilyn Monroe atop a churning seascape, or the frequent bits of found western iconography that resemble everything from the equestrian studies of Eadweard Muybridge to the hand-cranked effects of silent cinema’s early soothsayers to the optically printed desert panoramas of Pat O’Neill, these allusions seem to point in nearly every case to the influence of artists or filmmakers who approach storytelling primarily through the image. As in O’Neill’s work––and in particular his most recent feature, Where the Chocolate Mountains (2015)––PROTOTYPE’s aesthetic interplay between these many bygone styles, genres, and mediums takes shape through uniquely conceptual means––in this case via the prototype of the film’s title, a 1959 Philco Predicta television set. When we first encounter the screens, which number upwards of a half dozen, they simply stare back blankly, their glowing countenances hovering in a void that pushes toward infinity thanks to the additional depth provided by the stereoscopic image. Seen again a short time later, the screens are now busy with a variety of unrelated footage, some of which appear to be images we’ve previously encountered (and some of which anticipate episodes we haven’t yet experienced) as Williams takes us from Galveston into more recognizable spaces via swells of meteorological fury and other natural phenomena. In a manner after Godard’s Numéro deux (1975), Williams utilizes the monitors and re-photographed footage as a means to negotiate various temporal spaces. Moving in an out and across time, the film flows from event to event, from epoch to epoch, through transitions facilitated by this televisual network, which hums to life following the film’s prologue and steadily regurgitates vaguely alien images until, at the film’s climax, its circuitry is slowly subsumed and order is (temporarily?) restored. 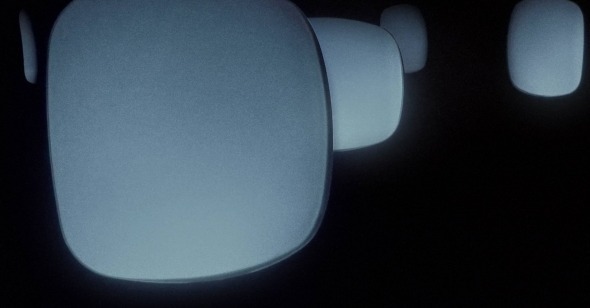 With its fluid approach to time and memory, the film as both an object and an idea is in a constant state of reorientation, and Williams, by locating an apt aesthetic corollary, is able to fully explore the material and metaphorical capacity of three-dimensional screen space. Few of these concepts are foreign to Williams, and in a sense PROTOTYPE is the film he’s been working toward since his adoption of anaglyph 3D a half-decade ago. Indeed, as a formal model, Williams’s approach here rhymes with an idea he explored when writing for Cinema Scope about Godard’s 3D feature Goodbye to Language. With the aid of stereoscopy, Williams writes, Godard was able to add a z-axis to French philosopher Gaston Bachelard’s concept of the “vertical instant”––“a moment during which scattered elements from disparate fields are thought to achieve unity, and the flow of time ‘shoots up.’” Williams’s scattered elements can’t begin to approach the scope and density of Godard’s (few, if anyone’s, could), but they’re just as precise and perhaps more purely cinematic. With PROTOTYPE Williams has achieved a holistic union of his own that speaks at once to the transformative power of the moving image and the oceanic force of its full deployment. Goodbye to language, indeed.